Two star-forming galaxies in the process of colliding 11 billion light-years away, as seen by a variety of telescopes. At right is a close-up view, with the merging galaxies circled. 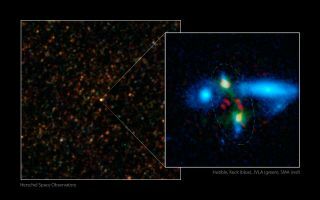 The red data show dust-enshrouded regions of star formation, while green and blue show carbon monoxide gas and starlight, respectively. The blue blobs outside of the circle are galaxies located much closer to us. Fu and his colleagues report their results online today (May 22) in the journal Nature.